Bud to be bought by Belgians? Anheuser-Busch Cos. [NYSE:BUD] faces a potential assault from beer giant InBev NV and activist investors that threatens to place the 150-year-old American icon in foreign hands. Leuven, Belgium-based InBev is weighing an unsolicited takeover of the Budweiser maker, people familiar with the brewer’s planning said on Friday. Anheuser-Busch shares jumped 7.66%, to $56.61 on the news, giving the company a market value of $40.4 billion. Trading volume totaled 11 times the daily average. InBev has yet to make a final decision on whether to pursue an unsolicited offer, an approach that would be fraught with complications, the people said. But now may be the time to strike given how the depreciating dollar makes U.S. corporate assets cheaper for foreign buyers. Behind SABMiller Co., InBev and Anheuser are the world’s second- and third-largest brewers as measured by volume. Together they would control 300 brands on six continents, brewing 10 billion gallons of beer each year. Both companies declined to comment on deal speculation Friday. InBev’s designs on Anheuser come as beer makers face pressure to trim costs because of increasing expenses for commodities such as barley, aluminum and glass, making it more important to gain economies of scale. Plans by SABMiller to combine its U.S. operations with Coors Brewing Co., a unit of Molson Coors Brewing Co., have also increased pressure for other brewers to consolidate. Heineken NV and Carlsberg A/S recently clinched a deal to acquire Scottish & Newcastle PLC, the biggest brewer in the United Kingdom. InBev, which makes Stella Artois and Beck’s, is eager to gain a foothold in the U.S., where it has a tiny presence. The U.S. is the biggest beer market in terms of profits, though sales growth is tepid. The companies have relatively little geographic overlap. InBev has a strong footprint in emerging markets, including Brazil, but is exposed to some slower-growth markets, like Western Europe. By combining, InBev and Anheuser would gain a stronger position in China, where they have both been expanding in recent years. China is the world’s largest beer market by volume. During my youthful years in Belgium in the early 1980s, Stella Artois was the primary beverage of weekend consumption … other InBev brands of Belgian brews include Jupiler (eh), Hoegaarden, and Leffe (mmmmm….). 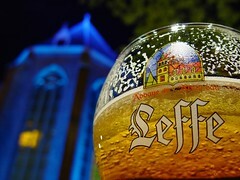 And what self-respecting cyclist doesn’t like Belgian beer? InBev also controls a host of other incredible world-wide brands, like Spaten, Skol, Staropramen, Bass, and Murphy’s.